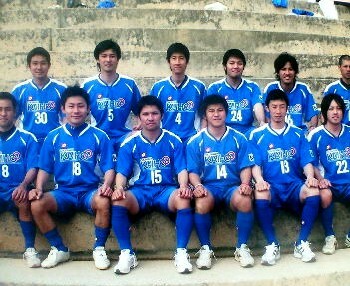 What a disastrous weekend it proved to be for 2006 champions V Varen Nagasaki in the Kyushu League. 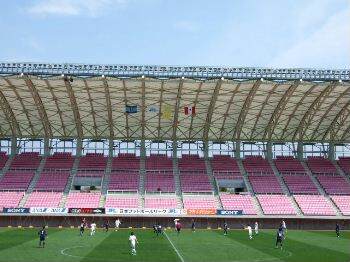 In their own fixture, they went down to a sensational 1-0 defeat at Okinawa Kariyushi - bringing to an end an unbeaten league record that stretched back to 2005 - but their closest rivals made good gains upon them. Indeed, top of the table now are Nippon Steel Oita, who took two points from the penalty shoot-out following their draw at Volca Kagoshima. Level on points with V Varen now are Honda Lock, 3-0 winners over Osumi NIFS United, and the ex-JFLers even have a game in hand over the beleaguered Nagasaki. But the middle of the division is also very tight. Volca's draw with Nippon Steel was a decent result under the circumstances, and kept them in fifth place on goal difference, but Kumamoto Teachers and Kaiho Bank SC both picked up their second wins of the year - against Mitsubishi Heavy Industries Nagasaki and wooden spooners Nanakuma Tombies respectively - to improve considerably their own chances of avoiding a relegation battle. Three games into the Kanto League Division two season and already favourites Furukawa Electrics Chiba are four points in front of the chasing pack. The team have made the most of their connections with JEF Reserves to boost their squad and kept their 100% record on Sunday with a 4-3 win over Yonoshukai. In second now are relegated Saitama side Hanno Bruder, but they only drew 1-1 with Ome FC, while the other club to come down from Division 1 - MSDF Atsugi Marcus - gained their first win of the season at the expense of Kanagawa Teachers. 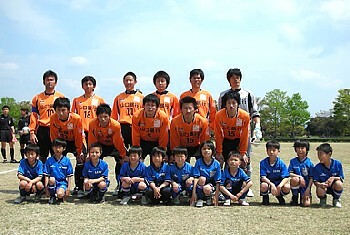 The result of the day, however, was undoubtedly Club Dragons' 9-0 thrashing of shock strugglers Nirasaki Astros. Promoted into Division 1 of the Kanto League only at the end of last season, FC Machida Zelvia and Hitachi Tochigi Uva have wasted little time in demonstrating the weak level of the region's football. The pair occupy the top two positions in the league after three rounds of the 2007 campaign, with Tokyo-based Machida confirming their new superiority thanks to a 5-1 drubbing of Saitama SC. 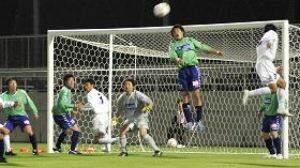 Hitachi meanwhile thrashed their Tochigi neighbours Yaita SC 6-0 to second on goal difference. 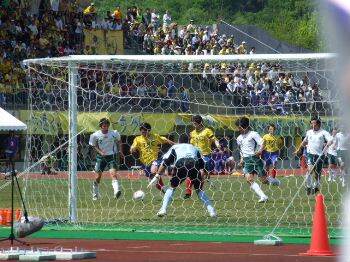 Level with them on points are Toho Titanium, 2-1 winners at 2006 champions YSCC; and Luminozo Sayama, who pipped Toshiba Fuchu with the only goal of the game. This leaves YSCC and Yaita yet to get off the mark at the foot of the table. Two teams lie joint top after three rounds of the Kansai League Division 2. Maintaining their 100% records are promoted team Hannan University - 6-0 winners on Saturday over Kohga School - and relegated Takada FC, who saw off Mitsubishi Heavy Industries Kobe. But Kihoku Football Group remain stuck to the foot of the table after their 7-2 thrashing at Kyoto Shiko Club, while Hermano Osaka and Riseisha FC participated in a remarkable game that ended with them enjoying an equal share of ten goals. It was an altogether fantastic weekend for FC Mi-o Biwako Kusatsu at the top of the Kansai League Division 1. On Saturday they thrashed AS Laranja Kyoto 6-0 to move three points ahead of deadly rivals and title favourites Banditonce Kobe. 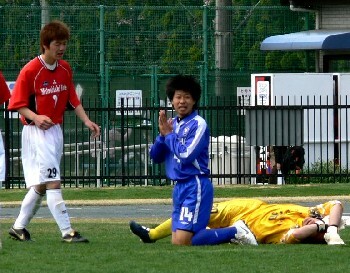 But then the following day, Banditonce sensationally lost their game in hand 1-0 to Osaka's Ain Food. All of which means that Banditonce, Ain and FC Kyoto 1993 - 1-0 winners at FC Glaspo Kashiwara - are all level in second place with six points. In the final game of the weekend, Kobe FC 1970 notched up their first points of the season by beating Sanyo Electric Sumoto 3-1. There are new leaders in the Hokushinetsu League Division 2, which is looking as if it may be one of the closest of the Regional Leagues in 2007. Saurcos Fukui, known until the close season as FC Kanazu and with an eye on a JFL and a J-League place, squeezed past Granscena Niigata 1-0 to move to the top at the expense of FC Antelope Shiojiri, who could only draw at Ohara School JaSRA. Relegated side Teihens FC go third following a 2-1 win over Maruoka Phoenix and even CUPS Niigata are also in touch with the promotion race. Following defeats in their first two matches, the side promoted from the Prefectural Leagues looked outclassed at the higher level of football but have since steadied the ship and in round 4 beat poor Toyama Shinjo Club 4-2. 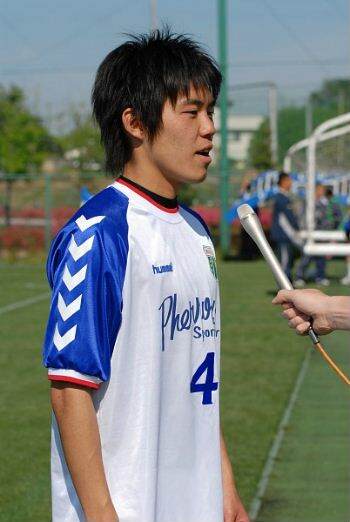 AC Nagano Parceiro's Yuichi Yoda was the goal hero in Sunday's big match in Division 1 of the Hokushinetsu League. The 29-year-old striker scored with seventeen minutes to go to claim a crucial three points and a win over local rivals Matsumoto Yamaga Club, in a top-of-the-table encounter watched by 6399 fans at Matsumoto's Alwin Stadium. This result leaves Nagano three points ahead of Yamaga, Japan Soccer College and Zweigen Kanazawa, the latter two of whom met in Niigata, with JSC running out 2-1 winners in a close game. Ishikawa's Fervorosa are now occupying their familiar mid-table position in spite of the investments in their squad made by club management during the close season. But following on from consecutive defeats in the first two games of the year, they have now won two on the trot after a comfortable 3-0 victory over struggling promoted side Valiente Toyama. It's Valiente who slip to the bottom of the table thanks to their nearest rivals Niigata University of Management and FC Ueda Gentian picking up a point apiece from a 2-2 draw. 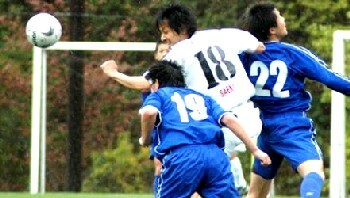 It was all business as usual on derby day in the Chugoku League on Sunday. Leaders Fagiano Okayama scored five in the second half against neighbours JFE Steel Western Japan to stay top on goal difference from Sagawa Kyubin Chugoku and FC Central Chugoku. Sagawa won the Hiroshima derby against newly-promoted Mazda SC 5-0, although FC Central somewhat scraped to a 2-1 win over Hiroshima Fujita SC. In Yamaguchi, Renofa Yamaguchi claimed their first victory of 2007 by beating lowly Hitachi Manfacturing Kasado 3-2, but the league title is already looking like a three-way battle as expected. It was a single goal fifteen minutes from time scored by ex-Kashiwa Reysol defender Kota Fukatsu that proved the difference between the two teams, as FC Gifu overcame Tochigi SC to win the vital early season top-of-the-table JFL clash on Sunday. This means that newcomers Gifu are now three points clear of Sagawa Kyubin SC, with seven wins and a draw from their opening eight fixtures, and are on course for promotion to J2 itself. Tochigi remain fifth - but also in the chasing pack, Yokogawa Musashino fell to a 1-0 defeat at Alo's Hokuriku, striker Kazuma Matsushita getting his name on the scoresheet. The lower half of the division looks all set to be as closely fought as the promotion race. Just four points divides the bottom nine teams, Sony Sendai, Arte Takasaki and Sagawa Printing level at the foot of the table. They were overtaken by an FC Kariya side who cruised to a 3-0 win over TDK SC, star striker Tomohiro Kato netting twice in the first twenty minutes for the Aichi club. And it was also a good day for Okinawa's FC Ryukyu, who went a goal down in only the second minute to Mitsubishi Mizushima but came back early in the second half to win 2-1. A busy round 8 JFL programme on Saturday saw five games scheduled, with important results at the top and bottom of the table. The key Tochigi SC - FC Gifu clash takes place on Sunday and Sagawa Kyubin SC took advantage to move back into pole position, two goals from Nobumitsu Yamane helping the newly-merged team to a 3-0 win over Gainare Tottori. It was a good day, too, for Rosso Kumamoto, whose 3-1 defeat of a Sony Sendai team now in freefall moved the former Kyushu Leaguers into third place. Yokogawa Musashino and Tochigi currently occupy fourth and fifth, but equal on points with them now are YKK AP. 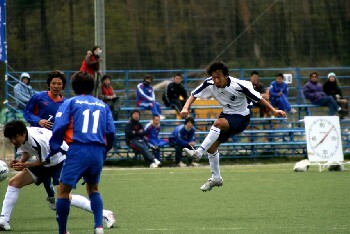 Experienced midfielder Haksun Fang's struck on the hour to claim three points at the expense of Arte Takasaki. Elsewhere, Kodai Suzuki netted twice but his Honda FC side could still only claim a 2-2 draw at JEF Reserves, meaning that the reigning JFL champions are already eight points off the pace and are slumped in mid-table. And coming up behind them are Ryutsu Keizai University, 3-0 winners at lowly Sagawa Printing thanks in part to two goals from giant defender Shakuon So. 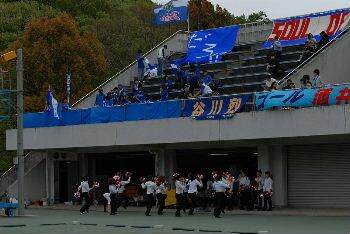 Going straight to the top of the early season table in Division 2 of the Kansai League are newly-promoted student side Hannan University Club. After a 6-2 defeat last weekend of Kyoto Shiko Club, they beat fellow university team Riseisha FC 2-1 on Saturday to maintain their impressive start. 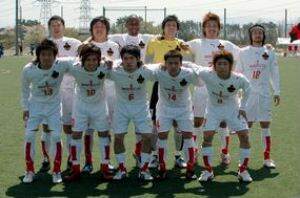 But Takada FC, relegated from Division 1 at the end of 2006, are behind them only on goals scored following their 4-1 win over Kihoku Football Group. Something of a shock is the fact that Mitsubishi Heavy Industries Kobe have also managed two wins out of two, their second three-pointer being a single goal affair with Hermano Osaka. 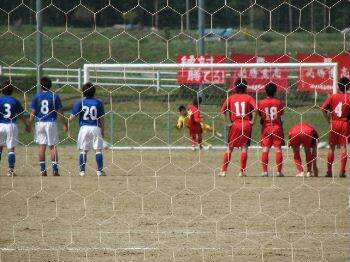 The fourth fixture of the round ended in a 1-1 draw, thus helping both Kohga School and Kyoto Shiko Club to get off the mark for the season. 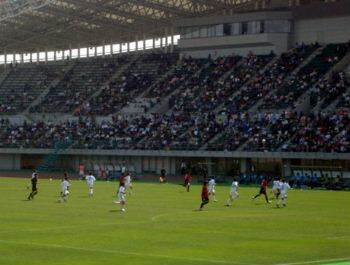 The Kyushu League 2007 schedule is already up to round 5 and last season’s top two sides – V Varen Nagasaki and Nippon Steel Oita – have yet to drop a point between them as they make a bid for the second year running to move up to the JFL. But V Varen’s goal difference is already far superior and they knocked in another four without reply in their match against struggling Osumi NIFS United. Nippon Steel meanwhile rather scraped to a 2-1 win over Okinawa Kariyushi. Honda Lock have a game in hand back in third place but easily saw off Mitsubishi Heavy Industries Nagasaki – whose days of early season shock success seem to be well and truly behind them. And playing catch-up in fourth are New Wave Kitakyushu, 3-0 winners this time over an underachieving Volca Kagoshima side. Down at the bottom of the table, however, Kumamoto Teachers managed an excellent 2-1 win at Nanakuma Tombies to move away from the relegation zone. 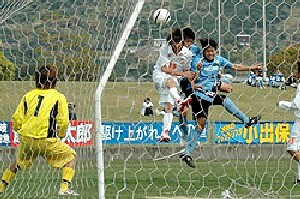 Goals aplenty in round 2 of the Chugoku League on Sunday, with champions Fagiano Okayama leading the way. They put four in each half past the whipping boys from Yamaguchi prefecture, Hitachi Manufacturing Kasado, and are top of the fledgling league table on goal difference. Just behind them, FC Central Chugoku and Sagawa Kyubin Chugoku both made it two wins out of two, FC Central rather surprisingly picking up only a 1-0 win over promoted side Mazda SC, while Sagawa took the local bragging rights in Hiroshima by beating Hiroshima Fujita SC 2-0. But the shock result of the round came just down the road in Fukuyama, where traditionally one of the league’s weaker teams, JFE Steel Western Japan, overcame Renofa Yamaguchi 4-1. 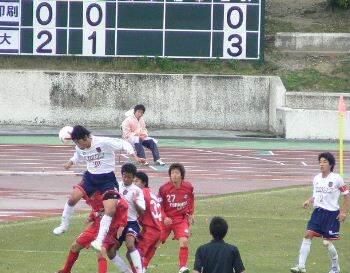 The former Yamaguchi Teachers side last year appeared to have made significant strides towards becoming competitive at Regional level, with the intention in several seasons’ time of making the push for JFL membership and then J2 itself. But this defeat by JFE calls into question how prepared Renofa are to provide any kind of challenge to the top teams in Chugoku. The sensational start to the Shikoku League 2007 campaign by Tokushima Vortis Amateur continued in round 3 on Sunday, with their most significant result achieved to date. Defeats of Ehime Shimanami and Sanyo Electric Tokushima were impressive enough, but a 2-1 win over title challengers Nangoku Kochi indicates that Vortis are genuinely in contention for the Regional championship. Of course, 2006 League winners Kamatamare Sanuki might have something to say about that, continuing as they did their own perfect start to the year by beating Ventana AC 4-0. 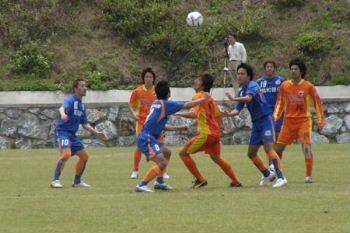 And in the two other fixtures, Ehime Shimanami at last got off the mark with a narrow 3-2 defeat of Sanwa Club, while in the day’s derby match Sanyo Electric Tokushima beat Tokushima Comprille SC 2-0. The Hokushinetsu League Division 1 is arguably shaping up to be about the most fascinating of Japan’s Regional Leagues in 2007. After Sunday’s round 3, Nagano prefecture rivals AC Nagano Parceiro and Matsumoto Yamaga Club are dead level at the top of the division with a 100% record and an impressive +12 goal difference, Parceiro having beaten minnows FC Ueda Gentian, while Matsumoto put five past promoted side Valiente Toyama. But Zweigen Kanazawa also have three wins out of three, the latest coming against relegation candidates Niigata University of Management, who like Ueda and Valiente have yet to get off the mark at the foot of the table. Perhaps the most significant result of the day, however, saw Ishikawa prefecture’s Fervorosa beat 2006 champions Japan Soccer College 3-2 - which has the potential to dismiss JSC from the title race altogether, so close is the competition. It’s all very close in Division 2 of the Hokushinetsu League following on from Sunday’s round 3 fixtures, four teams within a single point of the top spot. 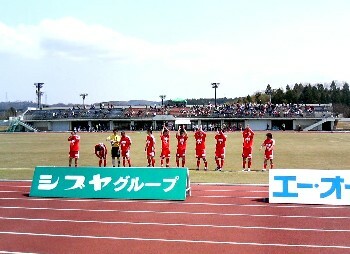 That’s currently held by FC Antelope Shiojiri, who were held to a 1-1 draw by Teihens FC and thus gave up their 100% record. But ambitious Saurcos Fukui overcame new boys Ohara School JaSRA 3-2 and in joint third place now are Granscena Niigata – shock 1-0 losers to local rivals CUPS Niigata – and Maruoka Phoenix, who ensured that Toyama Shinjo Club’s miserable start to the year continued by beating them 2-0. The Kansai League Division 1 is already showing signs of being a two-horse race, only a couple of rounds in to the 2007 season. Champions Banditonce Kobe continue to rule the roost - on goal difference at least, at this early stage - following their 4-0 drubbing of promoted side FC Glaspo Kashiwara, but right behind them are last year's runners up FC Mi-o Biwako Kusatsu. The team from Shiga prefecture picked up a comfortable 3-0 win over the Osakans of Ain Food to keep pace with Banditonce. It's Glaspo who rather unsurprisingly prop up the table for the time being, but the decline in recent seasons of Kobe FC 1970 seems to be continuing. Defeated at home by Ain, the side who were until the rise of Banditonce one of the top teams in the region lost again on Sunday, this time to AS Laranja Kyoto and as such they are yet to get off the mark. 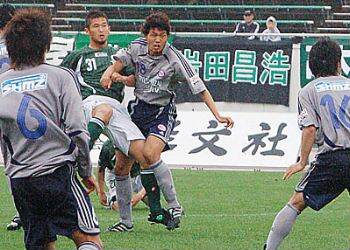 The final game of the round saw Sanyo Electric Sumoto fall to a shock defeat at promoted side FC Kyoto 1993. There are already clear leaders after just two rounds of the Kanto League Division 2 campaign, as pre-season favourites Furukawa Electrics Chiba underlined their status as the division's top side with a 2-1 win at Ome FC to add to their defeat last week of Kanagawa Teachers. Two points behind Furukawa are newly-promoted Yonoshukai and their Saitama neighbours Hanno Bruder, who shared the points in their match with a 2-2 draw. But four teams now have a single point, suggesting that this could be a closely-fought league in 2007. Relegated MSDF Atsugi Marcus also drew 2-2 with former Ibaraki Prefectural League side Club Dragons, but it's Yamanashi's Nirasaki Astros who prop up the table on goal difference following their goalless encounter with Kanagawa Teachers. 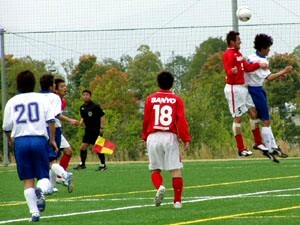 Two rounds in to the 2007 Kanto League Division 1 season and there are only a pair of teams left with 100% records. Top of the early table on goal difference are Saitama SC, who added to their 1-0 win over Toshiba Fuchu last week with an excellent 3-0 triumph on Saturday at Toho Titanium. But hot on their heels are newly-promoted Tokyoites FC Machida Zelvia, who the following day overcame 2006 champions YSCC by the odd goal in five. This leaves YSCC joint bottom of the table with Yaita SC, disappointing 2-0 losers to Toshiba Fuchu in what was already their second home loss of the new campaign. Bouncing back from their own defeat to Machida last weekend, however, came Saitama's Luminozo Sayama, thanks to a 2-1 win at Hitachi Tochigi Uva that leaves both sides in mid-table. 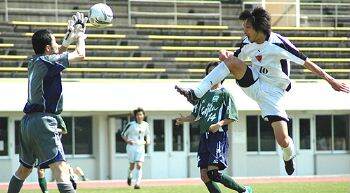 Tokai League 2006 champions FC Gifu hit top spot in the JFL after the round 7 fixtures over the weekend - and the Greens have a two-point advantage over their nearest rivals. Forwards Atsushi Katagiri and new signing Jorginho were both on target in a 3-0 win over Ryutsu Keizai University, while erstwhile leaders Tochigi SC needed a late Yoshiteru Yamashita effort to rescue a point from a 1-1 draw at home to Alo's Hokuriku. But in second spot on goal difference now are Yokogawa Musashino, whose excellent start to the season continued on Saturday as they thrashed Sony Sendai 5-0 with a brace from Koji Murayama. The other Saturday fixture was at Sagawa Kyubin SC, who became the latest in a growing list of top sides to be held by improving JEF Reserves. Masayuki Okamura, Sagawa's ex-Montedio Yamagata captain, gave his side the lead on the quarter hour, only for JEF to level things up just before half time. Rosso Kumamoto are now back moving in the right direction after consecutive defeats, Yutaka Takahashi's 52nd-minute goal proving enough to see off lowly Arte Takasaki. The result of the round, however, was undoubtedly at Honda FC, where last year's championship winners were beaten by an FC Kariya team who had thus far failed to pick up so much as a single point in 2007. 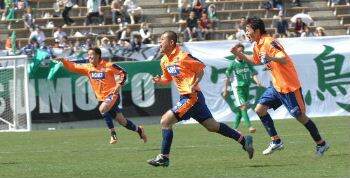 Experienced former Nagoya Grampus 8 man Hideyoshi Akita was Kariya's hero, with two goals in a sensational 3-1 triumph. All the other three matches ended in draws, YKK AP surprisingly let slip an advantage to finish 1-1 at home to Gainare Tottori from along the Japan Sea coast. Daisuke Machinaka's 87th minute goal grabbed a potentially vital point for Sagawa Printing at Mitsubishi Mizushima and TDK SC twice going in front only to be pegged back by FC Ryukyu in the JFL's longest away trip. Early leaders in Division 2 of the Hokushinetsu League after round 2 on Sunday are Granscena Niigata, formerly known as TOP Niigata. They recorded a 2-0 win over promoted side Ohara School JaSRA, both goals coming in the second half. 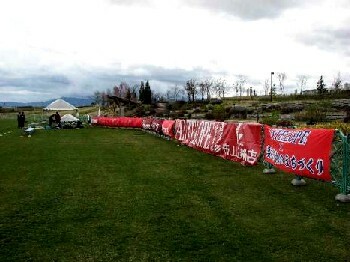 But level on points at the top with Granscena are Nagano prefecture's FC Antelope Shiojiri, who picked up a narrow win at Saurcos Fukui that was watched by 250 people. But at the wrong end of the table somewhat surprisingly are Toyama Shinjo Club, who conceded three in each half of a 6-0 drubbing at the hands of relegated Teihens FC. And propping up the table now are Japan Soccer College reserve side CUPS Niigata, who have yet to score a goal in 180 minutes of football following on from their 2-0 defeat at Maruoka Phoenix. 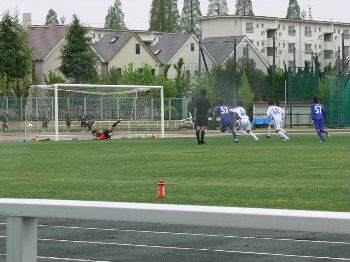 It was the big kick-off in Division 1 of the Kanto League on Sunday, with a series of fascinating matches for local fans. Long-standing league members Toho Titanium got off to an excellent start with a 4-1 win over Yaita SC, who having led the division for almost the entire season last year managed to drop down to third place on the final day. Former Saitama Teachers club Saitama SC managed a solid 1-0 win against a Toshiba Fuchu side about to embark upon only their second season of Regional football. 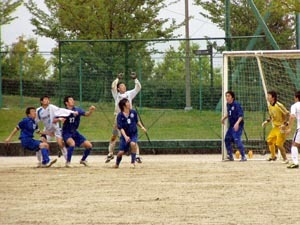 Surprise 2006 champions YSCC took on newly-promoted Hitachi Tochigi Uva, but crashed to a 3-0 defeat with all the goals coming in a disastrous second period. The other team to move up from Division 2, ambitious FC Machida Zelvia, recorded if anything an even better result against local big guns Luminozo Sayama, for with time running out their ex-Arte Takasaki defender Ryan Yon I snatched a last-gasp goal for a terrific 3-2 win. Unfortunately, only 150 fans were there to see it. 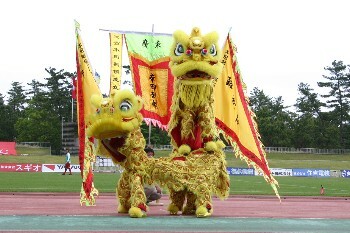 The Kanto League Division 2 began its 2007 season on Sunday with four new members - Club Dragons and Yonoshukai, promoted from the Ibaraki and Saitama Prefectural Leagues respectively, together with relegated sides Hanno Bruder and the military men of MSDF Atsugi Marcus. Hanno, relegated from Division 1 at the end of a campaign that saw them apparently ill-prepared to cope with life in the top division, beat Ryutsu Keizai University's reserve side Dragons 1-0 with a fifth-minute goal from midfield man Yasunari Ishimure. But Yonoshukai picked up an impressive 2-1 away win against Atsugi, which suggests that they may be well able to cope with what is their first-ever experience at this higher level of football. To do so, they will need to meet the challenge of promotion favourites Furukawa Electrics Chiba, 2-1 winners over Kanagawa Teachers. Nevertheless, the best result of the day came in Yamanashi, where Nirasaki Astros were thumped 4-2 at home by Saitama's Ome FC. Two rounds into the new season and the Shikoku League is in a state of shock. Last year's champions Kamatamare Sanuki and their predecessors from the south, Nangoku Kochi, may well have won both their matches with ease, chalking up an impressive goal difference on the way - but neither of them are top of the league table. That honour currently falls to Tokushima Vortis Amateur, playing only its second year of Regional League football and a club that experienced a mediocre 2006. Vortis hammered Ehime Shimanami 9-1 away on Sunday to move into pole position, while Nangoku were themselves putting eight past their neighbours from Sanwa Club. Kamatamare claimed a 6-0 win over Tokushima Comprille SC - the former Alex SC - and demonstrated the gradual broadening of their appeal locally with a promising 800 crowd, who saw a hat-trick from experienced midfielder Yasuhiro Koide. In the other game, Sanyo Electric Tokushima bounced back from last week's defeat by Vortis to record a 3-0 win over Ventana AC. After champions Banditonce Kobe sprinted out of the starting blocks on Saturday with a 5-0 defeat of FC Kyoto 1993, round 1 of the new Kansai League Division 1 season was completed on Sunday. Banditonce's probable nearest challengers, FC Mi-o Biwako Kusatsu, notched up a 4-0 win over newly promoted Osaka team FC Glaspo Kashiwara, who were previously known as Technonet Osaka. 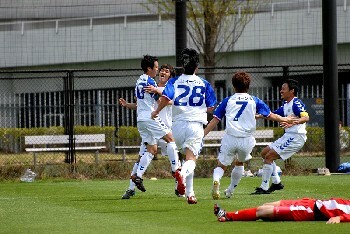 In the other game, company side Ain Food started the 2007 campaign by beating Kobe FC 1970 2-0. It was mostly a day of close games on Sunday in the Kyushu League, as the teams finished off round 4 following on from Honda Lock's defeat of Nanakuma Tombies on Saturday. Nippon Steel Oita kept their perfect start to the season going with a 1-0 win in Kagoshima against the students of Osumi NIFS United, while Kaiho Bank SC moved away from the foot of the table with their first win points of the season thanks to a 2-0 defeat of newly promoted Kumamoto Teachers. A goal in each half from midfield man Tomoki Hideka took the somewhat underperforming New Wave Kitakyushu past Okinawa Kariyushi. But the match of the day was undoubtedly the derby clash in Nagasaki, where Mitsubishi Heavy Industries Nagasaki sensationally led 1-0 at half time against local rivals and big guns V Varen Nagasaki. The 2006 champions and this season's favourites nevertheless fought back after half time and a hat-trick from ex-Rosso Kumamoto forward Keisuke Shuto contributed to a 6-1 win. The big four clubs in the Hokushinetsu League Division 1 all made it two wins out of two in the new league season on Sunday - and this league is shaping up to be one of the most closely fought of all Japan's regional competitions. Zweigen Kanazawa needed two late goals to come from behind and squeeze past Ueda Gentian, the winner coming seven minutes from time courtesy of former Rosso Kumamoto forward Daisuke Yoneyama. 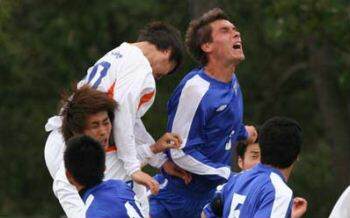 But champions Japan Soccer College had an easier time of it in their 5-0 win over relegation favourites Niigata University of Management. JSC are therefore dead level with Matsumoto Yamaga Club, who fought off the challenge of the best of the other four sides in the division, Ishikawa prefecture's Fervorosa. New striker Masato Katayama was again on target for Yamaga in a 2-0 win, which was watched by another excellent crowd of more than 1800 people. Current leaders on goal difference, however, are Matsumoto's local rivals AC Nagano Parceiro, for whom last week' hat-trick hero Taiten Sato added another two goals in a 4-1 defeat of promoted side Valiente Toyama. 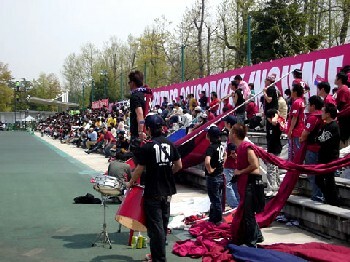 A crowd of 1538 people were there to see 2006 Chugoku League champions Fagiano Okayama begin the defence of their title in the first round of matches in the new season on Sunday. The Pheasants saw off Mazda SC, newly promoted from the Hiroshima Prefectural League, netting four goals without response - but even that was only the third biggest win of the day. Kota Fukuhara scored twice for FC Central Chugoku as they thrashed seemingly perpetual whipping boys Hitachi Manufacturing Kasado 7-1. In Hiroshima, Fagiano and FC Central's most likely challengers for the title Sagawa Kyubin Chugoku strolled to a 5-0 triumph over their neighbours from Fukuyama, JFE Steel Western Japan. 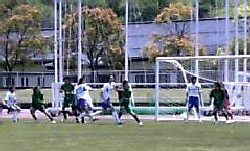 The fourth game pitched Hiroshima Fujita SC up against the developing former Yamaguchi Teachers side, Renofa Yamaguchi and this encounter ended goalless. 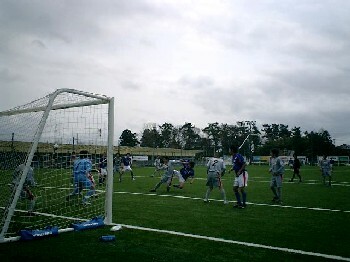 Previous Chugoku League rules would have meant that a drawn game was subsequently decided on penalties, but for 2007 the teams will instead follow standard practice and take a single point apiece. There were several major shock results in Sunday's round 6 JFL fixtures, with defeats for both Rosso Kumamoto and Honda FC and the end of FC Gifu's 100% start to the season. 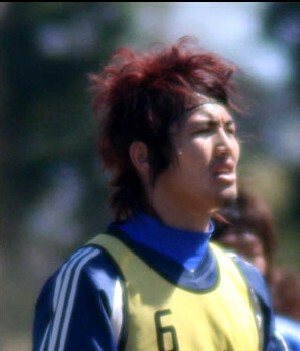 But replacing Sagawa Kyubin SC at the top of the division are Tochigi SC, for whom new midfielder Masamitsu Kobayashi scored the only goal of the game at Sony Sendai. Meanwhile, Gifu could only manage a scoreless draw at Alo's Hokuriku and they thus trail Tochigi on goal difference. YKK AP go fifth despite conceding a late Shogo Kawano equaliser at JEF Reserves - which means that early season league leaders Rosso drop down to sixth, after having suffered their second consecutive defeat. Beaten at home by JEF last weekend, they went 1-0 up after 19 minutes through Yutaka Takahashi, but eventually lost 3-1 at previously winless Gainare Tottori. FC Ryukyu also claimed their first triumph of the year with a superb 2-1 defeat of 2006 champions Honda FC, a sweet victory indeed for Ryukyu's ex-Honda coach Hideo Yoshizawa, while Mitsubishi Mizushima picked up a useful 1-0 win at Ryutsu Keizai University. 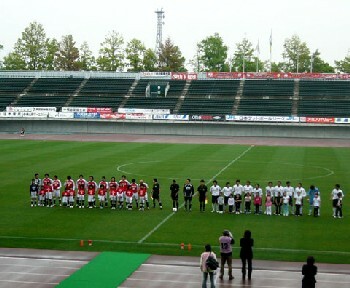 There was a full programme of games on Saturday to kick off the Kansai League Division 2 season for 2007. Newcomers to Regional League football Osaka's Hannan University Club in particular got off to a flying start, immediately notching up a 6-2 win over relegated Kyoto Shiko Club, although the other club to make the drop down from the top flight alongside Shiko, Takada FC, managed a 3-1 win over the students of Kohga School. Hermano Osaka ended up in third place last year and so just missed out on a promotion spot, but they began the new campaign with a 3-2 defeat of Wakayama prefecture's top-ranked team, Kihoku Football Group. 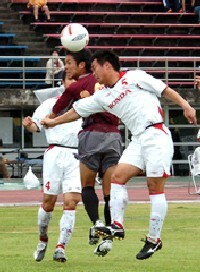 In the fourth game, two mid-table sides from 2006 could be separated only by a single goal, Mitsubishi Heavy Industries Kobe claiming a narrow win over another student team, Riseisha FC.